Hardship and opportunity are rarely ever separated by such a fine line as they are when starting a business in Japan. With its unique traditions and distinctive culture supported by its age-long history, Japan offers great potential for those who possess the virtue of patience and can withstand the test of time. Even for big corporations with practically unlimited resources and teams of trained professionals, Japan poses an exceptional challenge. Needless to say, this makes it even harder for a smaller company to establish itself. Although the obstacles might be great, the rewards are too, and Japan can provide the infrastructure to help even a small company succeed. Mr Weerasinghe, a commercial success story in Japan -- Click on image for enlargement. This is exactly what Mr Sasthri Rajaputra Weerasinghe, the President and CEO of S.S.H. Japan did. Not only did he start a company from scratch, he is currently one of the leading exporters of used cars from Japan. We had the opportunity to interview Mr Weerasinghe regarding his business here in Japan and the numerous obstacles he faced through the years. According to him, as a foreigner who aspires to launch a business, the primary obstacle is obtaining a visa. This is hard because of the difficulty of finding a sponsor. Yet, this is only one of the many obstacles to come, and it is far from being the biggest problem. 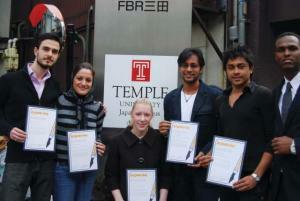 This article was written by the Temple University Japan – Student Charity Foundation (TUJ-SCF). The TUJ-SCF was founded in January, 2008 with the objective of helping those in need who live in lesser developed countries. Their first project will be constructing a minimum of 10 houses in Sri Lanka by May 2009, using funds from fundraisers and private donations. Ultimately, they strive to bring awareness to their peers about living conditions around the world, and create a desire to help those in need. While starting your own firm might be the goal, it is always a good idea to look for a local partner. This minimizes the difficulties of not understanding the way things are done in Japan, because starting a business can be a long and complicated process of learning. Once the previous two conditions are satisfied, it only gives way to more. The next step in the process is registering the company. Again, language becomes crucial in being able to do so. In order to register a company, one must show proof of residence and have an office. In addition, the company must register a hanko, which is a stamp that, once registered, becomes the authoritative signature of the company. It is of such significance that if this stamp were to be lost, so can the company. Once this is established, the company must satisfy a minimum number of employees. For a small and young company that is just starting out, even this might be problematic. The winning team with their certificates and classmate Dollar -- Click on image for enlargement. What is particularly interesting about Mr Weerasinghe is that as of 2006, he became a Japanese national. In accordance with Japanese laws and regulations, his Sri Lankan passport has been canceled, and he is now considered ‘Japanese.’ We asked him if becoming Japanese has made it easy for him to do business in Japan. In response, he claimed that contrary to what most people believed, he didn’t think that Japan was such a difficult place to run a business. He claims that most of the problems in Japan revolve around the issue of language. While the rules, regulations and customs tend to slow down the pace of establishing a business, he believes that this is one of the most desirable qualities about Japan. “Although building a business here can be a long process due to the numerous laws that must be satisfied, the very thing that makes starting a business in Japan difficult, becomes the very reason why continuing that business is far easier than in most other countries. I truly believe that the system in Japan is a reflection of its culture. And culturally, the Japanese are some of the most reliable, trustworthy and punctual people I have ever come across,” he claims. “When a Japanese person tells you they’ll meet you at 7:00, they’re usually there by 6:45. Worst case scenario, they’re on time.” Mr Weerasinghe claims that his perspective might sound controversial when compared to most other people’s opinion of doing business in Japan. However, he maintains that even though the level of cautiousness involved in Japanese rules and regulations can be a setback when setting up, working with people whose everyday life reflects such caution, sensitivity and precision in dealing with other people makes business much easier. Despite the numerous challenges that face foreigners in setting up a business in Japan, the rewards that come with it are worth the trouble. The key ingredient that goes into making a businessman successful in Japan is patience. With this virtue, all the obstacles that one faces in Japan can be overcome, and any business has the potential of truly rising high, in the land of the rising sun. The J@pan Inc-Temple University Business Writing Contest was held by J@pan Inc in order to encourage and recognize aspiring, young business people at Temple University, Japan (TUJ). The genesis of the contest owes much to Dollar Abshir Omar, a dynamic student at TUJ, who approached Metropolis and J@pan Inc about building links. Three clubs at TUJ participated, researching and writing articles. The other two entries, from the World Business Organization and from the Finance Club covered Apple in Japan and diversity in the work place respectively. The Student Charity Foundation’s article was particularly impressive earning them a spot in the magazine and certificates recognizing their achievement. We would like to thank all the students involved and hope to continue working with TUJ. Could you please include more information of Mr Sasthri Rajaputra Weerasinghe successes and struggles. More citation is needed in this article. Thanks for your comments. If you are interested in knowing more about Mr. Sasthri Rajaputra Weerasing, I would be happy to fill you in. Thank you very much for the article. Great article. "Mr. Weerasinghe is just smarter than everyone else"
"There are probably more smart people per square foot right here than anywhere else in the world, but Mr. Weerasinghe is just smarter." We would like to suggest that to publish a book relation to "Great Success of International Businessman". Because in Sri Lanka we do not have much books to use in the University when you studying a International Business. 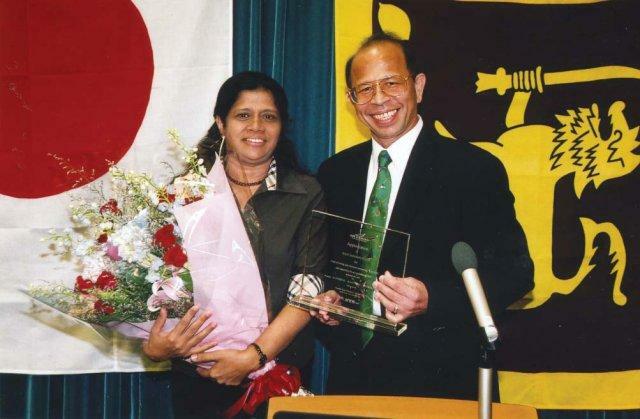 We can write a academic book about Mr. Weerasinghe's business Knowledge and experiences and how it relate to the Sri Lankan business culture, Japanese Business Culture and also to other countries that he is conducting business. in future with your company. As vehicle importers in Sri Lanka we should be very grateful for Mr.Weerasinghe for bringing Sri Lankan name to Japanese international trade in automobile industry by becoming one of the most known vehicle exporter to Sri Lanka as well as for providing quality and reliable vehicles for the Sri Lankan market. We wish you the utmost success in achieving your business goals. The Proprietor of Udani motor Traders.